Between my last two trips to Walt Disney World two beloved attractions, on opposite ends of the experience scale, received facelifts. By now you’ve heard all the reviews and seen all the videos, but I thought I would be shirking my responsibilities if I didn’t give you my commentary on the new renditions of Star Tours and the Enchanted Tiki Room. I am going to warn you now, there are spoilers from both attractions in my report, so if you haven’t seen them yet and wish to be surprised, it may be better for you to come back tomorrow. 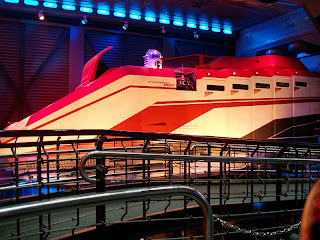 Let’s start with the more recognizable entity, Star Wars, and its galactic space adventure Star Tours. The queue has seen some upgrades and interactive elements, and the introduction of Captain Rex and his more functional counterparts, but overall it has kept the same feel of a bustling starport. I love the inclusion of a comical, and bumbling, baggage checker and security checkpoint, it gives the terminal a more realistic feel. The only question the queue left me with is that the Starspeeder 1000s comes equipped with a new camera droid known as the IC-360, but aside from a short clip on the queue’s viewscreen and his placement on the Starspeeder 1000, he doesn’t appear to have any role in the attraction. My question is, will we ever seen this little guy in action? As for the ride itself, it should come as no surprise that a mix up puts C-3PO in the captain’s chair onboard our Starspeeder 1000. The basic outline of the missions are all the same, a rebel spy is discovered in the passenger cabin, a jump to lightspeed brings us to a recognizable planet, a message from the Rebel Alliance gives us a new destination, which we jump to in an attempt to keep the spy safe. I felt from the first glimpses at the new destinations that being planetside would be the most extraordinary part of the new, random adventures. I was wrong. As with all stories, the strength of the new Star Tours is in its characters. Encounters with Admiral Ackbar, Darth Vader, Jabba’s sail barge, Yoda, Sebulba, Jar Jar, the Millennium Falcon, and Chewbacca are wonderful, but, for this child of the Force the moments against Boba Fett and in the presence of Princess Leia were priceless. I miss the quips of Captain Rex and run through the Death Star’s trenches, but C-3PO is a masterful addition and with each new planetary path my heart skipped a few beats at the little details. I believe these new adventures will continue to entertain padawans and Jedi knights for years to come. And now for something completely different, the Enchanted Tiki Room. This is not your father’s Tropical Serenade, but it’s close. After a freak fire (an appraisal of the Under New Management show by the tiki gods perhaps? ), the powers that be decided to bring back a truncated version of the original show. Having cloudy memories of Tropical Serenade, but crystal clear recollections of Disneyland’s show, put a smile across my face throughout the entire production. True, Zazu and Iago have flown the coop, returning the show to its original supervision, but it is the preshow where the magic begins. Bringing back Claude and Clyde (or should I say Clyde Birdbrain), and their tale of how they discovered the Enchanted Tiki Room, sets the tone for a timeless and light-hearted performance. Once inside, the classic theme of the Sherman brothers echoes through the hall alongside other crooning standards. 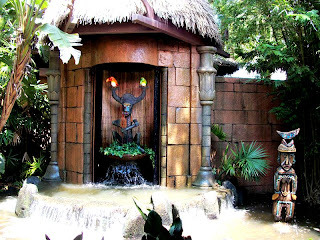 The absent show elements, including the majestic fountain, are sorely missed, but I would take condensed version of the Tiki Room show than a full-length version presided over by Iago. All that you have heard is true, there is something magical happening over at the Enchanted Tiki Room. The new life, or resurrection in one instance, brought to these two attractions gives me hope for the future of attraction refurbishments. Walt Disney wanted to see continual growth and positive changes in his parks, and Star Tours and the Enchanted Tiki Room give us evolution in spades, while honoring the history they have meticulously gathered over their time in Disney’s Hollywood Studios and the Magic Kingdom, respectively.